The Wildcat Sanctuary's WISH LIST helps rescue and support wild cats! There’s a wonderful way you can help the cats – and the caretakers – by shopping for them this fun and easy way. We keep an ongoing list of important, much-needed items on our AMAZON WISH LIST HERE. And, if you haven’t joined our Facebook family yet, be sure to HERE so you can see the cats having a great time when their wish list items arrive. Something else that helps in a big way! This could be one of the easiest ways you can ever help support the cats – and it’s free! 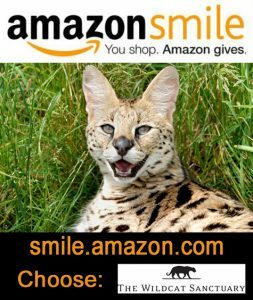 If you shop on Amazon – ANYTIME & EVERY TIME – .5% of what you spend can be given to the cats – at no cost to you! Amazon has set up a program to donate to YOUR favorite charity each time you shop, and we’ve made it simple for you to do. Scroll down to click on the sign-up you see on the right side of this page. Follow the instructions just one time – that’s it! 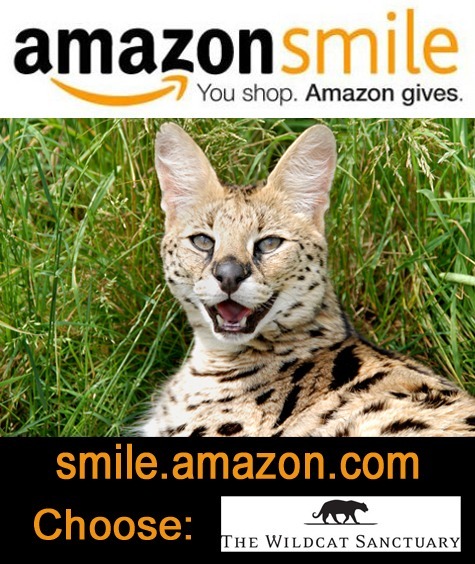 Then, every time you shop Amazon, as long as you remember to log on through www.smile.amazon.com, a portion of your purchases can be donated to the cats automatically. You’ll find all the same products when you log on through https://smile.amazon.com/ as you do on the regular Amazon site. If you have trouble with the sign-up here on the right side of our page, you can also go to https://smile.amazon.com/ and follow the steps detailed below. 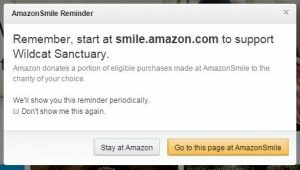 Since it will be your first time logging in using https://smile.amazon.com/ , you’ll see a prompt to choose your charity. 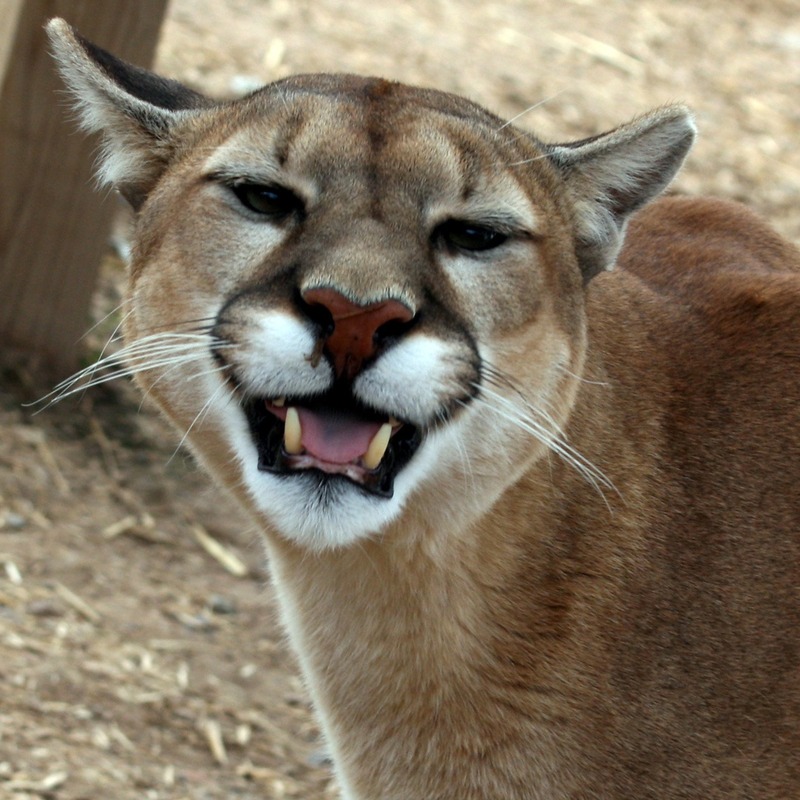 Type in WILDCAT SANCTUARY as the charity you’d like to choose. 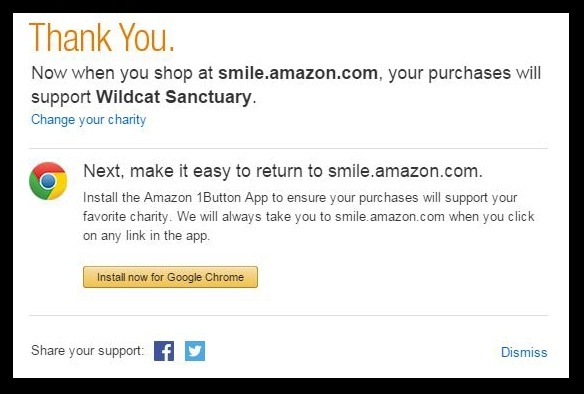 Then, you can set up a bookmark that makes it easy to remember – ANYTIME & EVERY TIME you shop on Amazon, do it through https://smile.amazon.com/ and a donation will be sent to the cats! Please let your family and friends know about this easy – and FREE – way to help support our rescue work.